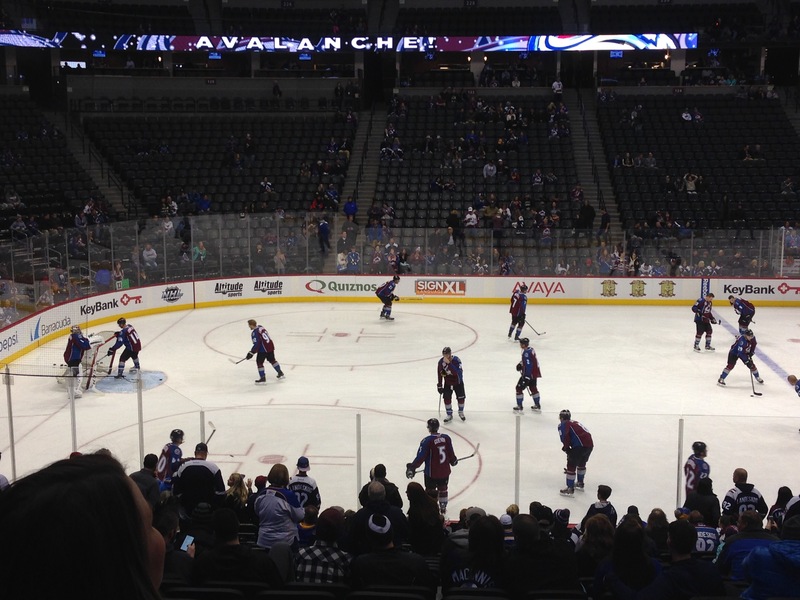 New Experience #13: Go Avs! It’s taken me a while to get motivated to write this post, not because it wasn’t a great experience (it was), but because I seem to have picked up a bonus on the train or at the game–a nasty head cold. Lucky 13? I don’t know. I’m finally feeling a bit better, so here we go. Being who we are, we decided to forgo “stuff” as Chanukah gifts for our college-aged niece and nephew and give “experiences” instead. Luckily, this also means new experiences for me! 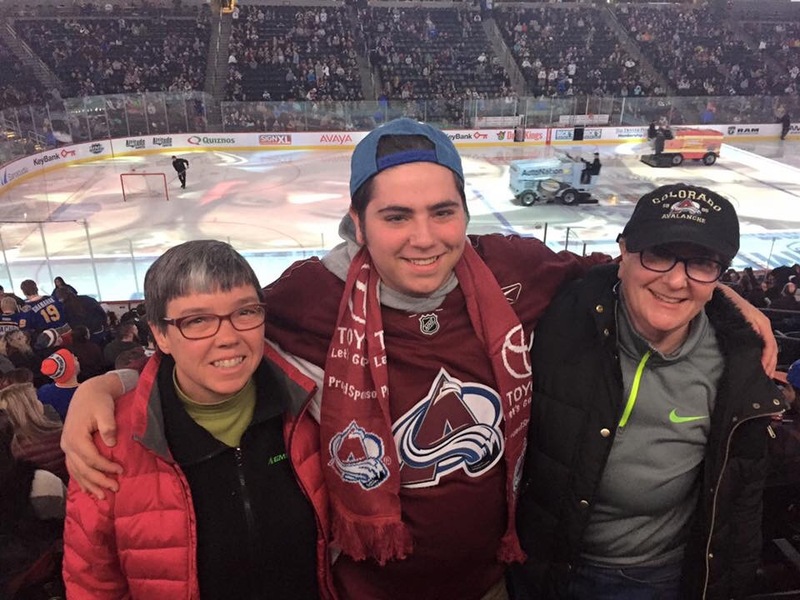 On January 6, we had the first of these experiences, when we took nephew Sam to a Colorado Avalanche game at Pepsi Center. We took the light rail downtown, and I learned something else about the new RTD fare scheme. A round-trip ticket on the light rail is now the same price as a day pass. Thus, if you know you are making a return trip, you can just buy a day pass. Unfortunately (for reasons you’ll read later), I did not figure this out until after we’d bought one-way tickets for the ride into town. 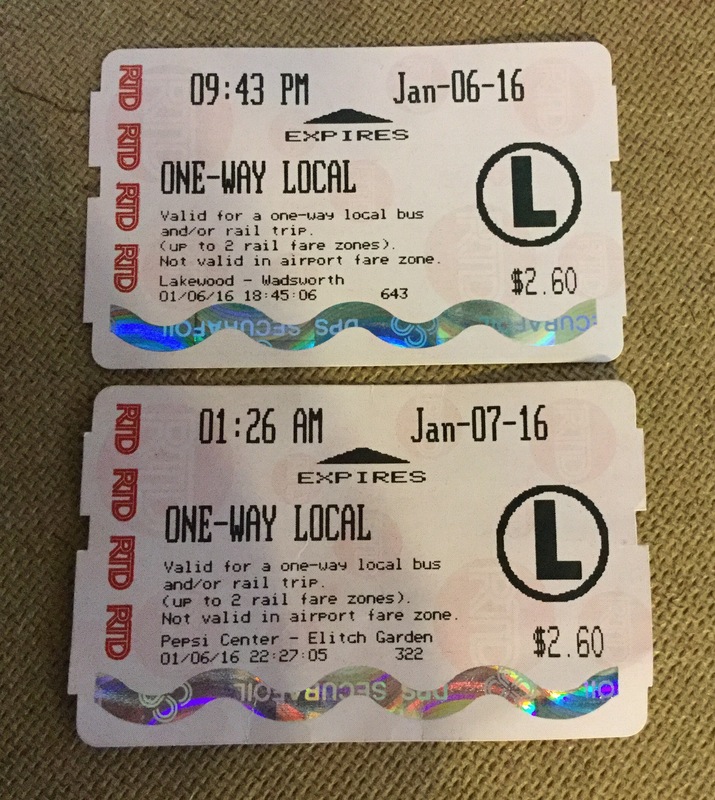 One-way tickets with expiration times. Day pass = two one-way fares. We got there easily, picked up our tickets at Will Call, and met Sam. This was a KYGO “Puck Pack” deal, so the tickets also came with drink tickets and $5 vouchers for merchandise. I was a little skeptical about what $5 could be used for, but it turned out that they had a deal of the night (which I suspect they do for all the KYGO games) offering Avs mugs that were usually $9 for $5. 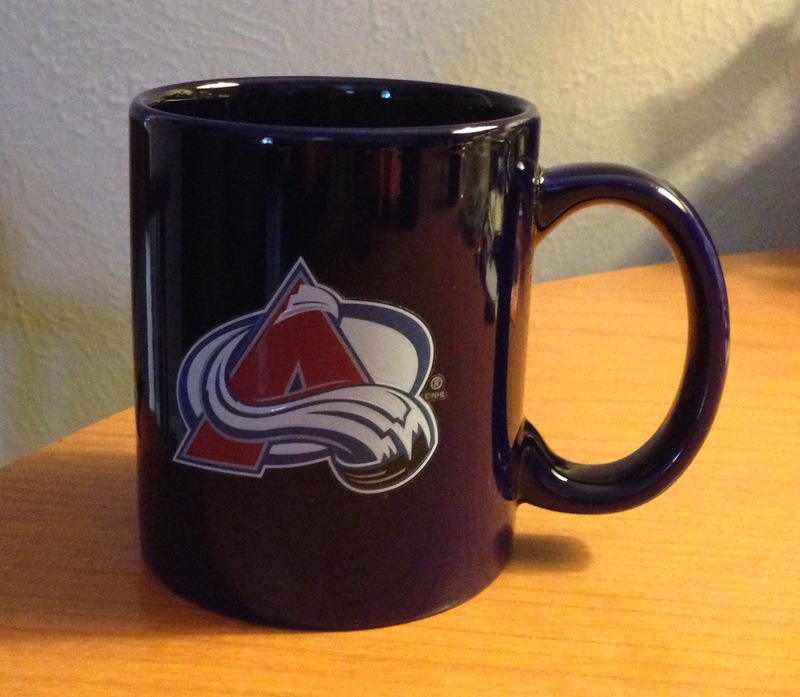 So we all got Avs mugs for just the tax on $5! Next we wandered upstairs and made a lap of the arena to find the included drinks (a can of Pepsi product or a cup of Coors Light) and see what else was on offer. We scored koozies from Sport Clips and Avs gloves (Sam got a scarf) from Toyota. Maureen got some caramel corn and Sam some nachos before we made our way to our seats. We had decent seats (included with the Puck Pack deal)–much better than when we went to a Nuggets game a few years back. The music was pretty loud and the temperature was pretty cold, so be prepared if you choose to attend. As I told Sam, the only thing I knew going in was that the goal was to get the puck into the net. Fortunately, he knows the game well and explained icing, offsides, and power plays while the teams were still warming up. I think I was most surprised at how few players are actually on the ice at any one time during the game. We enjoyed watching the game, even though the Avs were outplayed at times. We saw a few power plays and no real fights. As we got close to the end of the third period, Maureen and I decided we needed to head to the light rail, as train frequency decreases from every 15 minutes to every 30 minutes to every hour as the night wears on. We also didn’t know if there would be any problem obtaining our return tickets (it would have been easier with day passes in hand). The Avs were down one when we left, then scored to send the game into overtime. They ended up winning in overtime as we waited for the train to arrive! I’m pretty sure we would have missed that train (and had to wait a long time) if we had stayed, but it would have been nice to see the last two goals too. All in all, a good evening out.